*This article was authored by ROBERT YANCEY, JEFFREY WOLLSCHLAGER, COLIN MCAULIFFE, JACOB FISH and originally published in the 2017 Showcase magazine by aerospacetestinginternational.com. 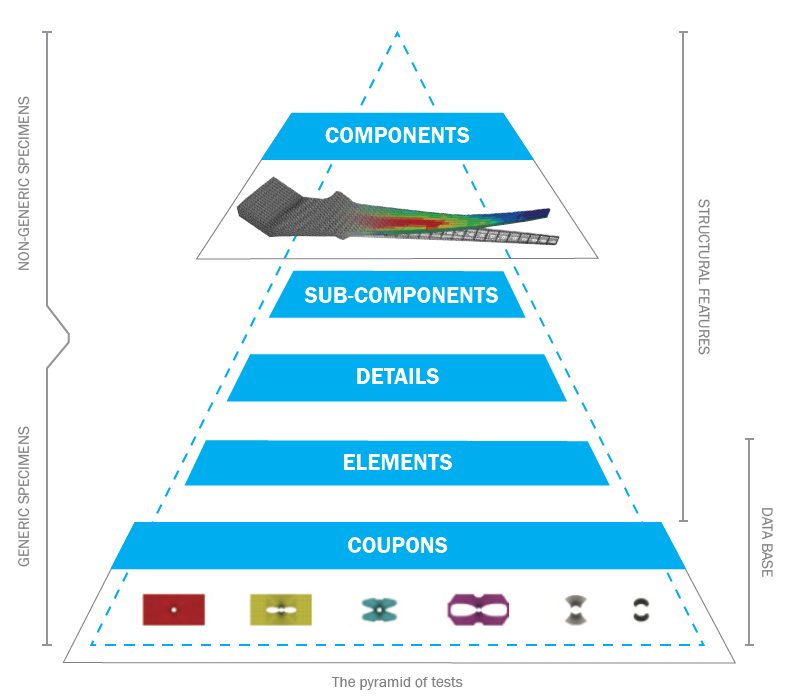 With the application of composites in aircraft structural components, material qualification requirements have been a costly burden on airframe manufacturers. Substantiation of such structures requires analysis at multiple levels of FAA building-block diagram (Figure 1). As one proceeds up the building-block diagram, the number of samples is reduced since structural complexity increases. For example, the greatest number of specimens is usually tested at the lowest level when factors such as batch variability and environment are included in the test. Typically, the number of specimens approaches 1,000 mechanical tests at this lower level. In contrast, only one test article is used at the highest level of the building block diagram (Figure 1), which usually consists of a full-scale test. To account for variability in strength, fracture toughness, fatigue life and durability, arising from geometrical variability and stochastic nature of materials, the usual standards adopted are the A-basis and B-basis allowables. The most popular B-basis allowable is defined as the value above which at least 90% of the population is expected to fall with 95% confidence. To determine B-basis allowables, a relatively large sample size is needed. For instance, to obtain a B-basis value, a minimum of 29 test replicates are required. If the measured values fit Weibull, Normal or Lognormal distribution, the B-basis value could be calculated with a smaller sample size. However, since the variance of an estimation using data from a test with a small sample size could be rather large, the B-basis value would be much lower than that estimated with a large sample size, resulting in an underestimated strength owing to insufficient statistical information. In practice, design allowables are determined directly from the tests at a desired level (for instance, the scale of bolted joints). Since substantial testing is needed, this direct test approach appears to be too expensive. For a single fastener and a given composite material in a static test, variables to be investigated include hole size, laminate lay-up and thickness, environmental factors, load form, geometry, fastener head type, joint type, etc. For each test configuration, between five and nine test replicates are required. As an example for a single bolt joint, double-lap shear test, the Bearing/bypass Laminate Strength Test Matrix given in the Composite Materials Handbook (CMH 17) lists 113 configurations and 725 tests. Thus the direct approach is too expensive. It is possible to somewhat simplify the direct test approach by estimating the average strength from full-scale tests with a small sample size and then approximating the variability in strength from the variability of the strength at a lower level in the FAA building-block diagram (Figure 1). To circumvent the need for an exhaustive experimental database, which is often not available, a current area of interest and research is the use of virtual material models to generate the material and structural allowables. Virtual models can be substantiated with available test data and then exercised to produce virtual allowables for new material systems or different material or structural configurations. Experimental validation will always be needed, but the goal is to allow for allowable generation with a much smaller set of physical tests. Multiscale Designer from Altair Engineering offers an alternative computational certification approach, which is schematically depicted in Figure 2, that relies on limited experimental data at a coupon level. First, a high-fidelity deterministic multiscale solver based on the reduced order homogenization (ROH) method is aimed at efficient solution of multiscale problems. The ROH constructs residual-free stress fields and thus eliminates the need for costly discrete equilibrium equations in the representative volume element (RVE). This removes a major computational bottleneck and thus permits accounting for arbitrary micro-mechanical details at a cost comparable to the phenomenological modeling of non-linear composites. Furthermore, ROH possesses considerably fewer material constants that need to be experimentally calibrated than a single-scale anisotropic model, and thus, deterministic or stochastic inverse analysis can be conducted with relative ease. Second, the stochastic inverse multiscale solver is aimed at reverse engineering (or identifying) probabilistic density functions of micro-constituent elastic and inelastic properties based on the observations of quantities of interest at the macroscale. The non-intrusive inverse multiscale solver is based on the measure-theoretic approach. It takes advantage of the fact that the likelihood function, which relates the model parameters to observations, is a deterministic map defined by the mathematical and computational model, which permits computations of the inverse problem with relative ease. The non-intrusive stochastic inverse solver possesses adaptive features including identification of a nearly optimal sampling domain using enhanced ant colony optimization algorithms for multiscale problems, incremental Latin-hypercube sampling methods, adaptive discretization of the parameter and observation spaces, and adaptive selection of sample numbers. Third, a stochastic forward multiscale solver based on the Stochastic Collocation approach, which, when combined with the Sparse Grid approach and the Karhunen- Loeve expansion, outperforms other non-intrusive methods. The workflow of a computational certification process offered by Multiscale Designer is schematically illustrated in Figure 2. 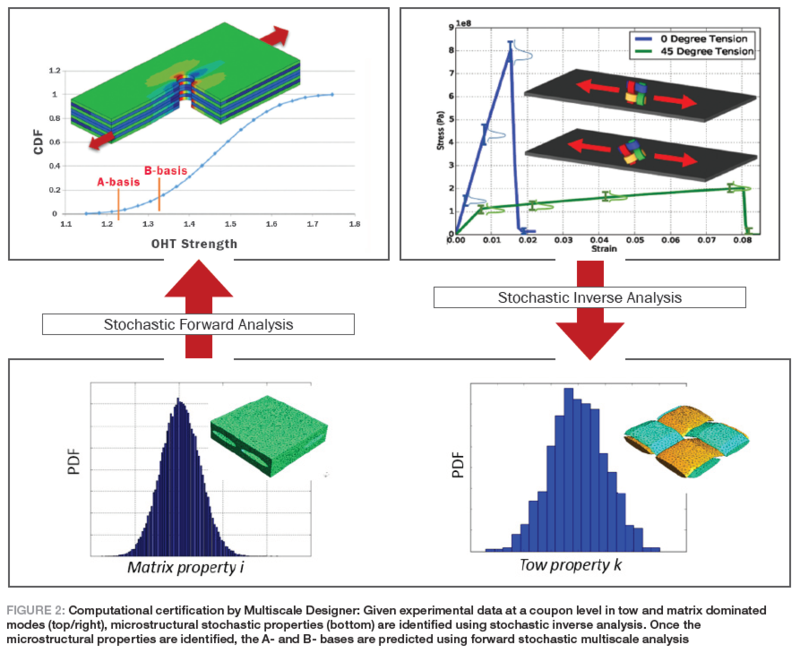 Given experimental data for a composite material of choice, Multiscale Designer is first invoked to reverse engineer the probability density functions of microstructural properties, such as elastic properties and parameters of inelastic constitutive equations of damage, plasticity, or some combination of the two. Multiscale Designer has an extensive built in library of inelastic constitutive laws that can be assigned to various micro-constituents. Once stochastic microscale material properties have been identified, Multiscale Designer conducts virtual experiments by sampling over the points in the space of random parameters to compute A- or B-basis. The sophisticated mathematical approach is implemented in an easy-to-use framework, where available test data can be input and the required functions are computed and applied to the data to generate the A- and B-basis allowables. This method can also be used to predict damage initiation and progression, fatigue performance, damage tolerance, and other material and structural responses to load that are typically tested physically. Given the complex nature of current aerospace systems and the heterogeneous materials used, a virtual testing framework is required for practical applications of new materials and new structural configurations. The multiscale approach discussed here is a major step forward in reducing physical tests and taking full advantage of the computational power that is available to us today. Bob has degrees from MIT, Virginia Tech, and University of Dayton with a focus on Aerospace Composites. His current role is to define the strategic direction of Altair to meet the growing and changing needs of the Aerospace and Composites Design and Analysis community. He meets with companies and organizations throughout the world to gather their input and communicate to them the solutions Altair provides.